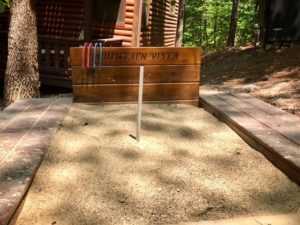 Our new Beavers Bend horseshoe pit has already been a huge hit with guests! Recent Mountain Vista visitors said they spent tons of time throwing shoes last weekend. The beautiful new custom pit was installed last week with “Mountain Vista” ingrained on the box. Solar lights have been installed in case the battle for ringers goes past dusk. The Mountain Vista horseshoe pit receives additional light from the second level of the cabin. Seats are situated around the pit to provide relaxation in case of a grueling match. The history of horseshoes dates back to the second century. Here’s more than you’ve ever wanted to know about the sport! 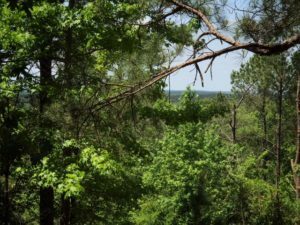 You’ll be able to see the Kiamichi Mountains from the Mountain Vista horseshoe pit. How close is the nearest cabin? How close will the nearest live music be cranking at night? Does the cabin charge resort fees? Does the cabin charge cleaning fees? Does the cabin charge insurance fees? Do a little homework before visiting a Broken Bow luxury cabin and you’ll have a much better experience. Also pay attention the popular “firewood charge.” If $100 for a few sticks of wood sounds like a great deal to you, go for it! We never charge these add-on fees at Mountain Vista. The firewood is free along with s’mores kits and a plethora of other upscale amenities. 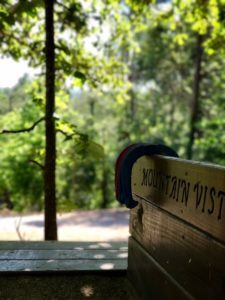 Mountain Vista has a few days open next week, but hardly any weekends available until August. Make sure to download our Beavers Bend app. All the local hot spots are on it along with our blog. We created the app with Mobile Roadie in Los Angeles. Mobile Roadie does many apps for rock stars, including Madonna and The Rolling Stones. Thousands read our blog monthly. The tourists love it… cabin property management companies charging you ridiculous add-on fees hate it. Enjoy the new Mountain Vista horseshoe pit and please remember to wager responsibly!